Use your PS3 to watch movies or listen to music that’s on your computer, wirelessly! We know our consoles can play games and stream Netflix, but did you know they could just as easily stream the video or audio that’s on your computer? That’s right! There’s no need to burn cd’s/dvd’s or transfer files to a USB stick. Your Playstation 3 or Xbox 360 can access media on your computer through the shared Internet connection and double as a media server. All you need to do is install a program and you’ll instantly be able to play the movies or music from your computer straight onto the TV your console is connected to. The software is free, open-source software that transcodes (converts on-the-fly) videos into a compatible format and streams it to play on your TV. So you know what this means? This means that the yoga video that I have uploaded for all of you to enjoy, can easily be watched on that TV in your living room without being confined to your computer monitor or laptop. You could get your family to get in on the yoga too! But of course you are not limited to just movies… you could entertain your guests by playing music or even showing them photo albums. Some other notable features are that you could even browse through zip/rar files, view photos in RAW format and you don’t need any codecs as it will transcode any video file no matter how obscure the format (including MKV, FLV, OGM, etc). 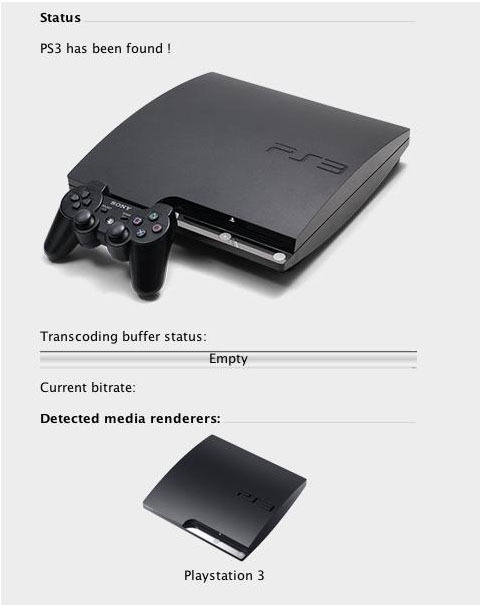 The following instructions are specifically for the PS3. It’s pretty much the same thing for an Xbox. Step 1: Download “ps3 media server.” and install it. Versions exist for Windows, Mac OS and Linux. Note: Even though it’s called PS3 Media Server, it works for the Xbox 360 as well because they expanded its capabilities overtime thanks to the magic of open source collaboration. Step 2: Turn on your PS3/Xbox and log in. Now when you run the program, on the status tab, you should see this picture (or a similar image) indicating you are connected! 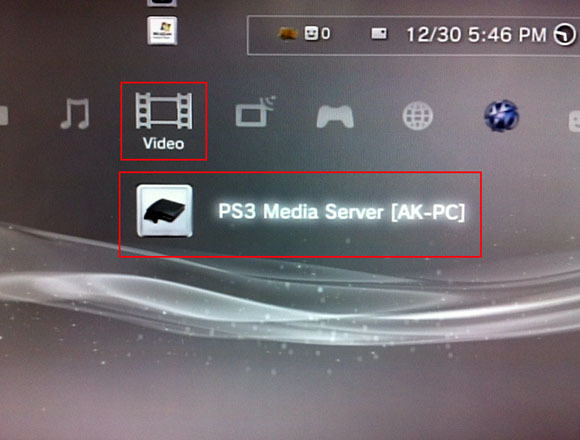 Step 3: Since the program has successfully detected your PS3, the “PS3 Media Server” should now appear on the cross media bar. Go to Video (not Video Services) and then choose PS3 Media Server. And that’s pretty much it! You are now able to browse your computer files and directories the way you would on your own computer and play whatever you find. There’s no folder configuration needed! If you’re a Windows 7 user, your media files are most probably found at C:\Users\YourUserName and then My Videos, Photos, Music, etc.